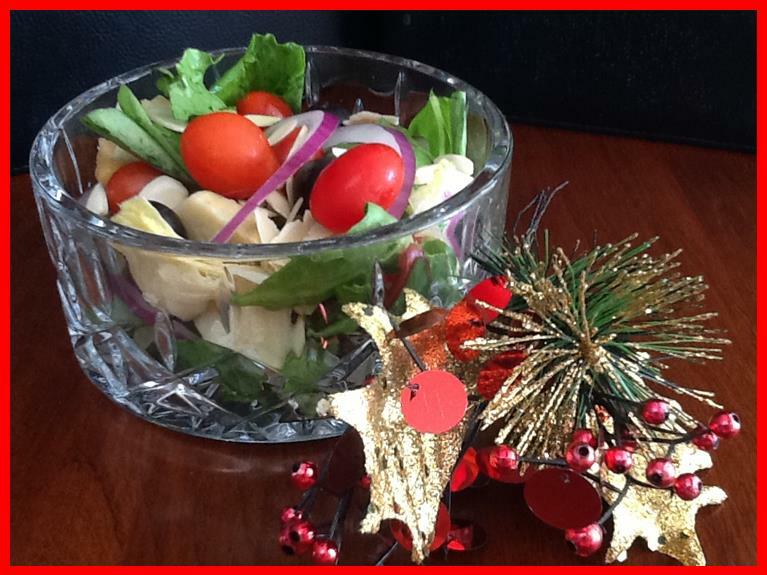 A healthy Holiday Salad is easy to make and adds a healthy, festive touch to your meals. Instead of tossing the salad together in a large bowl, consider making individual portions and placing the ingredients into each dish to arrange the vegetables to best visual advantage. Once dressing is poured onto the salad the bright and beautiful colors are often obscured, so you may want to serve the salad "dry" and let each person add their own dressing. Wash your vegetables carefully using a Fruit/Vegetable cleanser and rinse well. Spin or pat dry lettuce, well. Slice the onions, and cut the Artichoke Hearts in half or even thirds. In each of four medium sized serving bowls, place about a handful of lettuce. Add the Artichoke Hearts, and Black Olives. Place several Grape Tomatoes on top and push gently to nestle them into the greens. Add Red Onion Slices and sprinkle with a few Sliced Almonds. It take just minutes and has a bright and colorful appearance, and of course, a delicious taste. We dressed ours with 3 Tbs of a good quality Raspberry Vinegar on 1 Tbs of good quality Olive Oil. Shake in a jar and pass. Any dressing would be fine, just make sure that it isn't high in fat if you are a healthy eater - a fatty salad dressing can ruin a nutritious salad from a health perspective. To add a little Holiday Flare to your meals, place a few decorations on the side or top of your place settings. 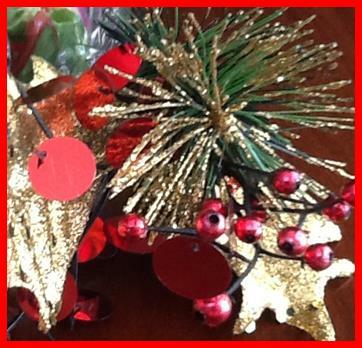 The one pictured is simply a decoration sold for packages. We find that adding little flourishes like this to our table helps remind us of the special joy that this season invokes. We hope that your are paying attention to making healthy and nutritious meals, taking time to enjoy well balanced meals and always remember that you can be an Everyday Gourmet!